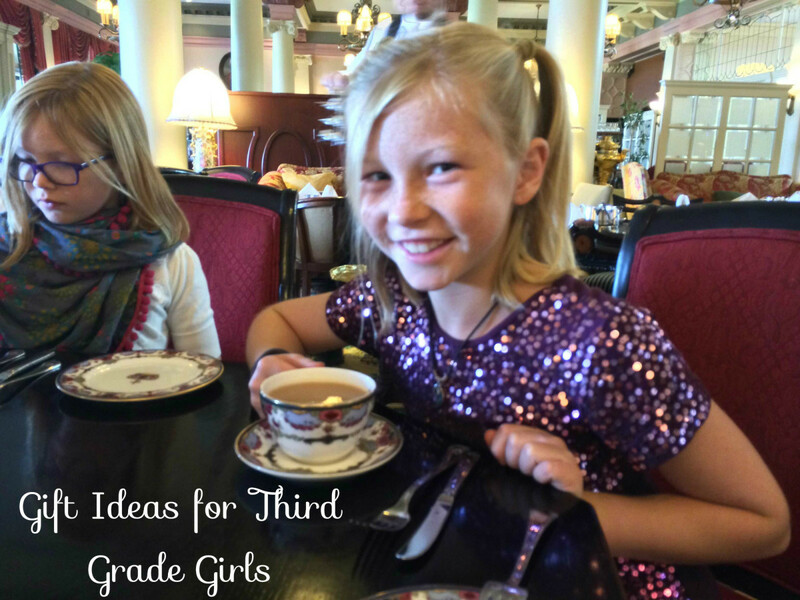 This list of ideas has been built over many years with lots of love for our six year old daughters. Sometime you just need ideas of gifts for six year old girls. Enjoy! Please vote for each gift suggestion. At the end of the year, I'll remove the ones people don't like and add new ones to the list. girls really love their birthdays and even if the birthday gift isn't perfect if there is ice cream she will likely be very happy! She may also have strong feelings about the theme of her party. Each year I make a list of gift ideas. All of these ideas have started by asking a six-year-old girl what she wants for her birthday or Christmas. Each year I include a poll for readers to vote for the suggestions. I try to keep gifts that 60% of readers think are good. Gifts people don't like are removed. For example, last year I removed the reusable lunch box because only 45% of respondents thought it was a good idea. I also removed things like a water bottle, kids high heels, and an ipod in 2016. 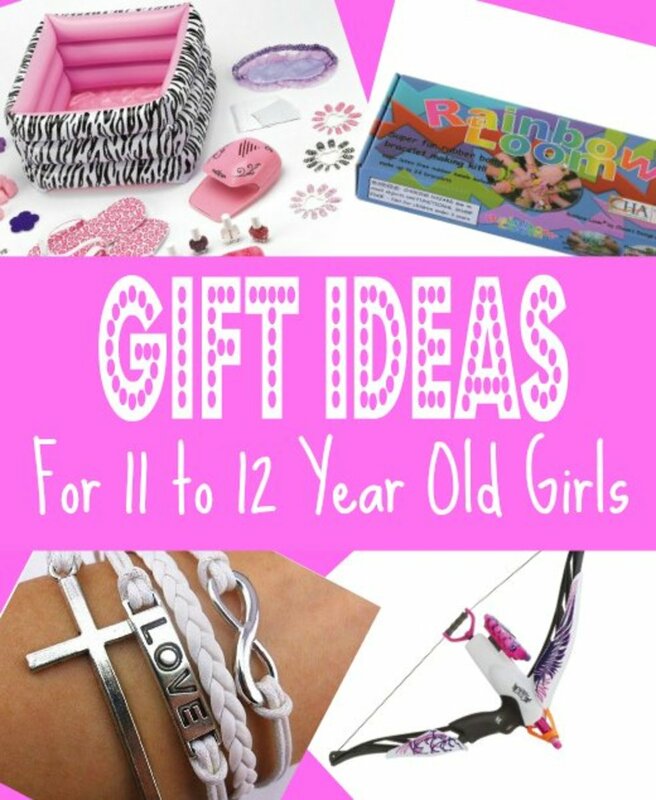 We hope to create a list of perfect Christmas gift or birthday gift ideas that all kids will love! 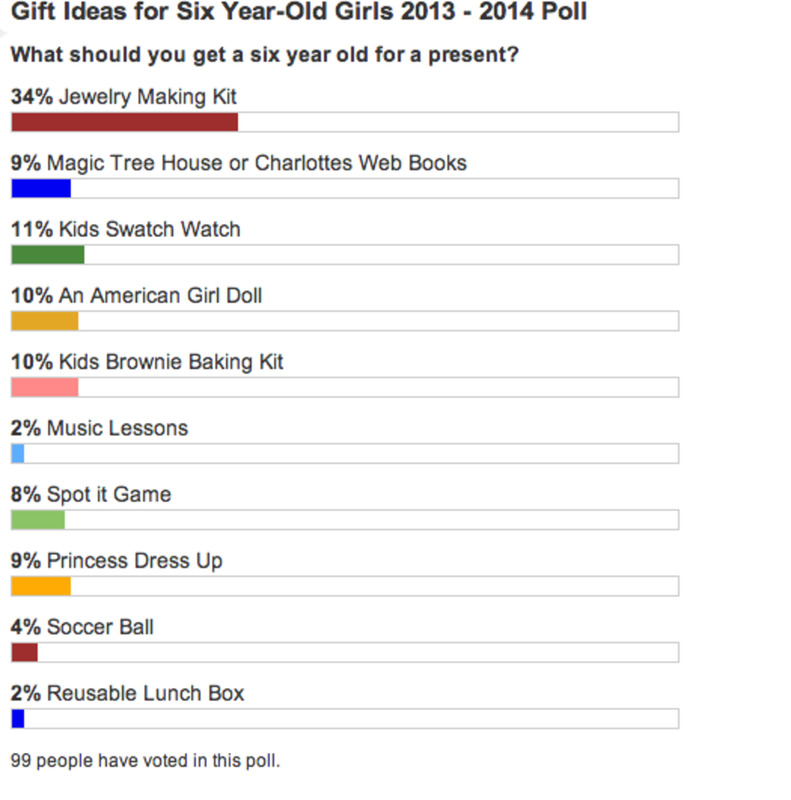 For the last couple of years, a jewelry-making kit has won the overall poll as the best gift idea, but in 2016 - 2017 readers are choosing Magna Tiles as well as girls legos, non-toxic nail polish, and age-appropriate books. Jewelry-making still remains hot going into 2017, as Rainbow Loom Bands are still popular with little girls. In fact, the most well-liked gifts appear to be related to arts and crafts. For 2017, the trend continues. The two most well-liked gift ideas are Maga Tiles and a girl's lego toy set. Lots of little girls love crafts and love jewelry. At the local elementary school, you can see that kids are going nuts for these rubber-band ring and bracelet kits. This is why we are suggesting this as the perfect toy for a girl. 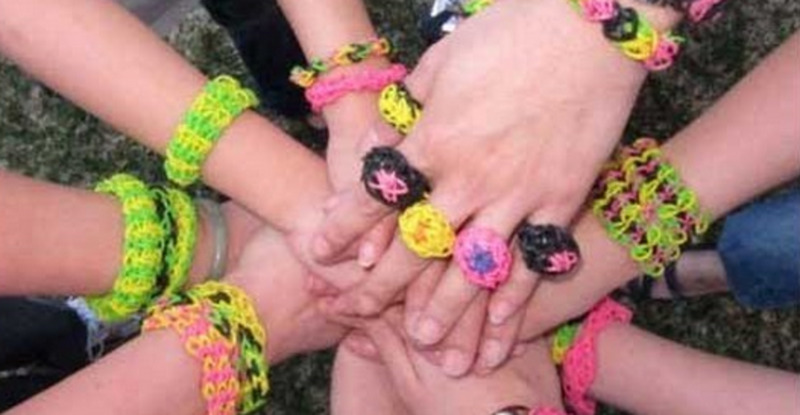 The most popular package seems to be from Rainbow Loom Bands. A loom for creating the jewelry comes with a bunch of multi-colored rubber bands, and you can buy replacement bands. Our six-year-old girl loves this and spends hours playing with it. The kit and the bands seem overpriced for what they are, but they are a bargain, given how much our girls play with them. Is a Jewelry Making Kit a great gift idea for a six year old girl? It's pretty common for little girls to get scared in the dark, or to have a bit of trouble going to bed. Parents can make a dark bedroom more inviting by plastering the walls and ceiling with glow-in-the-dark stars. Our daughter was pretty excited about turning off the lights and getting into bed so she could see these stars glowing in the dark! 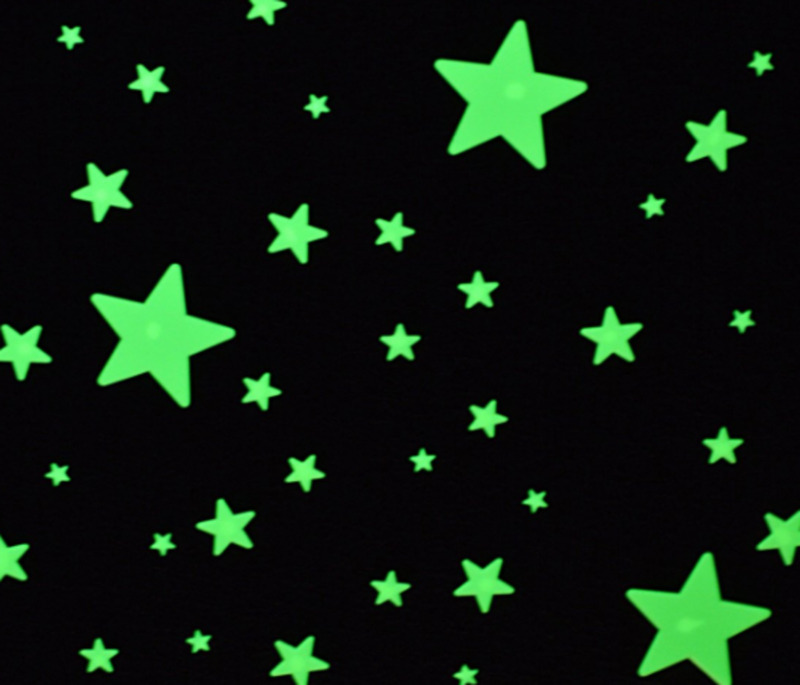 Are Glow in the Dark Stars a great gift idea for a six year old girl? Development studies show six-year-olds enjoy structure in their games and activities. In Spot It, each card has exactly eight symbols, and each pair of cards shares exactly one symbol. Spot it! While Spot It says it is for kids seven and over, reviewers say younger kids enjoy it, and our six-year-old picked up on it pretty quickly. It’s pretty fun to play with her. 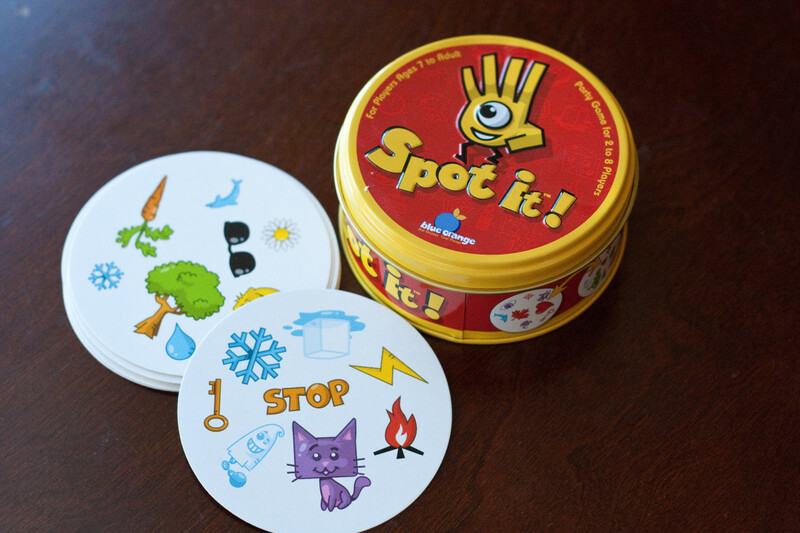 Is Spot It a great gift for a six year old girl? 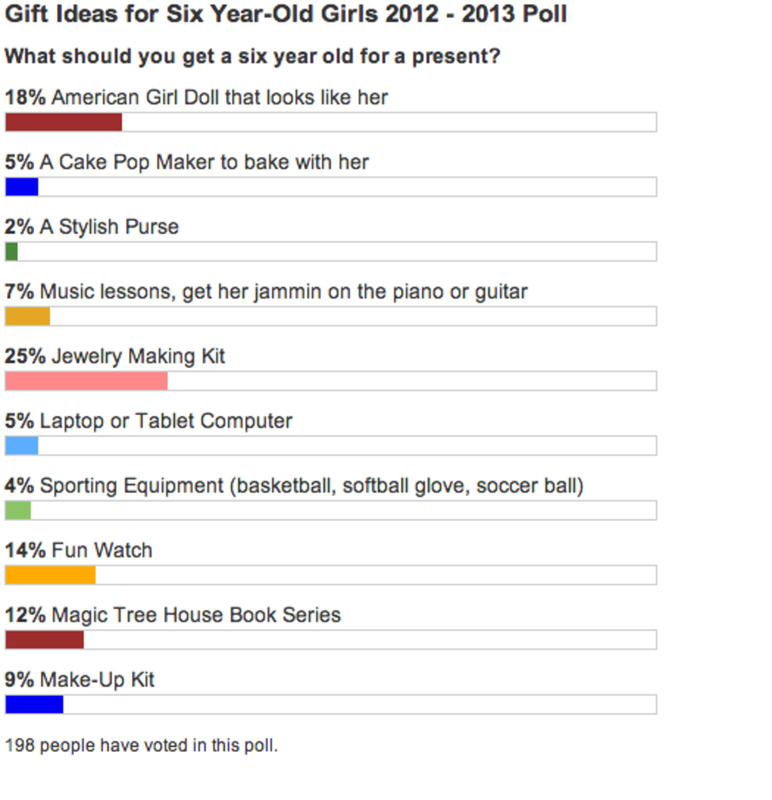 American Girl makes a high-end doll, for which you can buy all sorts of clothes. You can even send a picture of the child and get a doll that looks like the little girl, with a matching outfit. Our six-year-old received this gift from her Grandma and loved it. 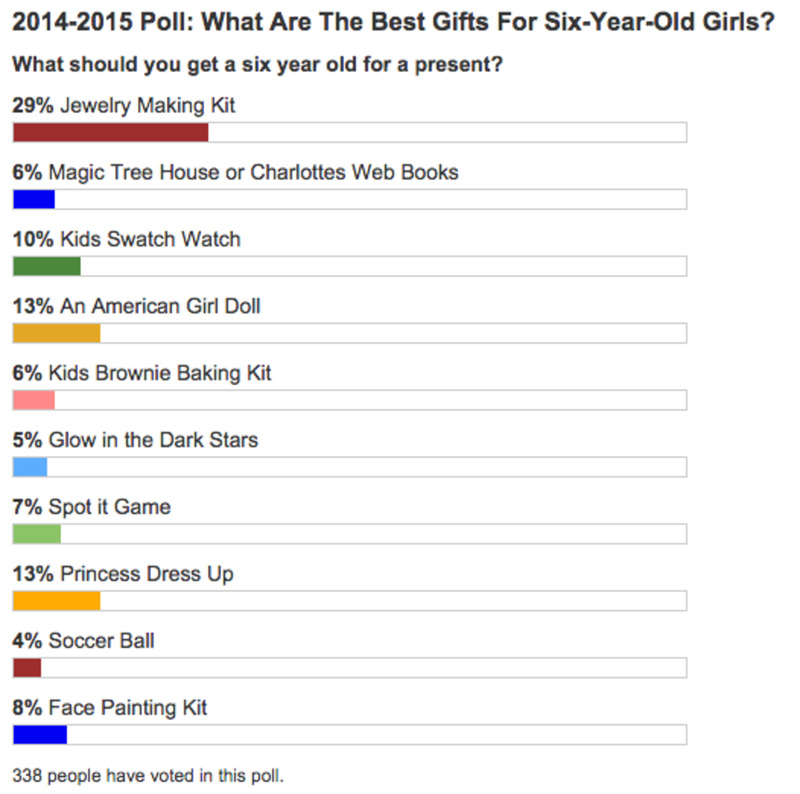 Is an American Doll a great gift idea for a six year old girl? 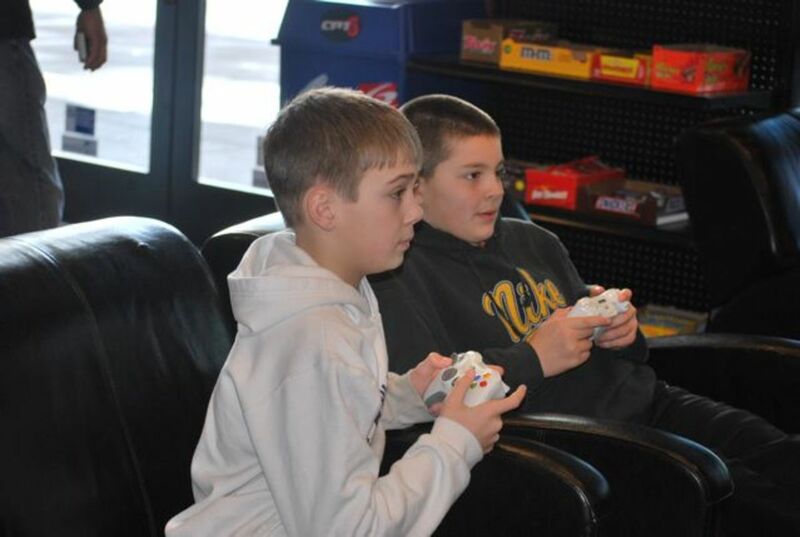 Six is a great age to develop a few physical skills like hand-eye coordination or foot-eye and a love for sports. A softball and bat may be the perfect gift for a little slugger. Also, the American Youth Soccer Organization (AYSO) puts together soccer teams for girls that age and younger. Get her a ball, and kick it around with her outside on a sunny day! Little girls need a small-sized soccer ball. Six- and seven-year-olds use a size three while eight- to eleven-year-olds use size 4. A six year old boy uses a size three as well. 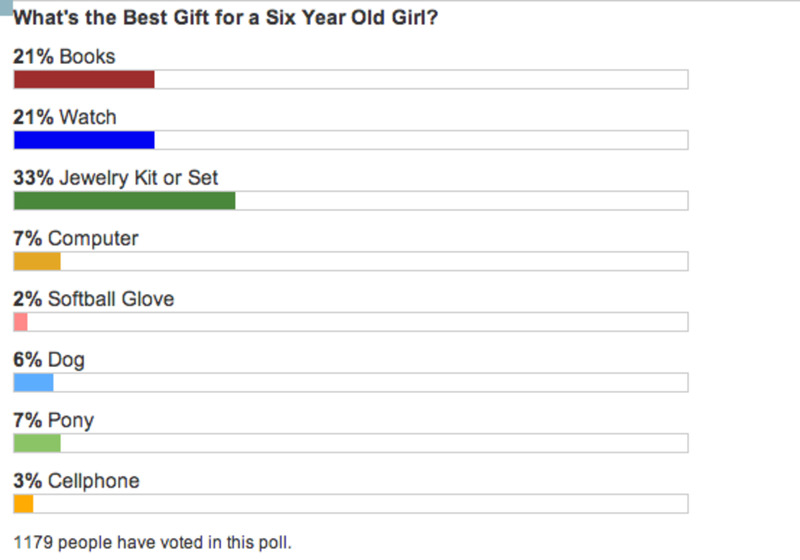 Is a Soccer Ball a great gift for a six year old girl? Some kids are pretty high-level readers by the time they're six. Getting them great books and reading to them is a fantastic way to encourage this healthy habit. Some favorite books for six-year-olds are E.B White books like Charlotte's Web and Mary Pope Osborne's Magic Tree House series. Is the Magic Tree House series a great gift for a six year old girl? Gifts are a great way to give kids more responsibility; that's why I love the idea of giving a six-year-old a watch. For example, I can say, "I want that TV off in ten minutes," and then I can show them where the hand on the clock will be. My favorite is, "Let's see how fast you can take a bath and get in your pajamas." Give her a watch, and she'll have a tool that lets her become more responsible for herself. Young girls also have definite opinions on what is cute. Swatch makes kids' watches for $40-50 that are exceedingly charming, maybe even beautiful. Is a kids Swatch Watch a great gift idea for a six year old girl? 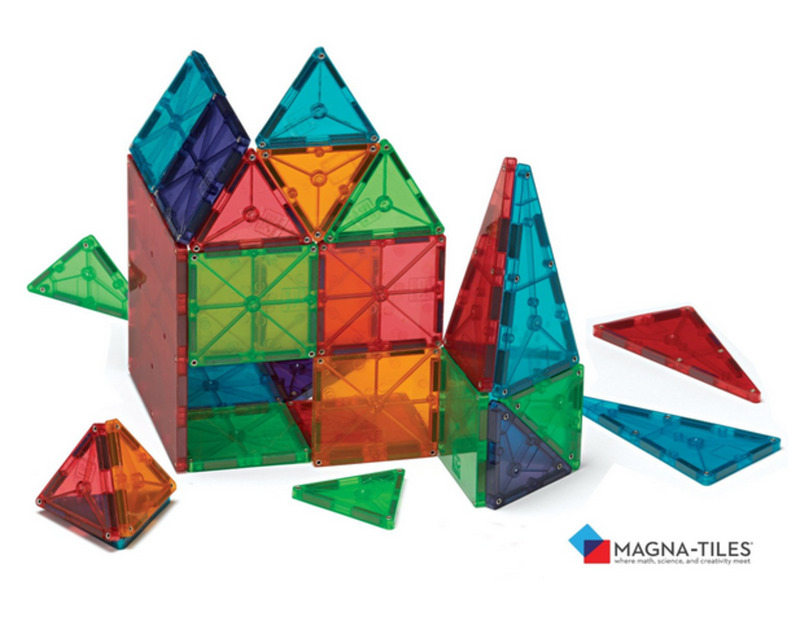 In 2016, our poll shows that Magna tiles are the most well-liked suggestion. We purchased Magna tiles as a gift for our daughter when she was younger, but as she developed with age, her creativity exploded. I have to say, I didn't want to spend the money on these toys (very expensive) because I thought they would end up in a box and never used. However, they turned out to be an excellent value because our daughter has played with them for years. The tiles are similar to blocks that come in various shapes and sizes, but they connect with magnets. She builds patterns on the floor to elaborate castles. As far as toys go, this is the best option in my opinion! Each little girl is different, but at six, some little girls enjoy dressing up like princesses. On our trip to Disneyland, I was amazed at the girls getting totally into all things princess (and it wasn't just the little girls either). While I don't particularly like the whole princess thing, I do appreciate that children like to be creative and dress up. When I was five or six, I'd wear a cowboy outfit and love it. I can see why little girls love dressing up in a princess outfit as well. Is a Princess Dress a great gift idea for a six year old girl? Our daughters have loved various art supplies. Oil pastels are much brighter than chalk. Their little creative minds can come to life. One of the most impressive pieces of artwork I've seen created by a young girls is a pastel of a tiger's face. It's amazing what they can produce with these. 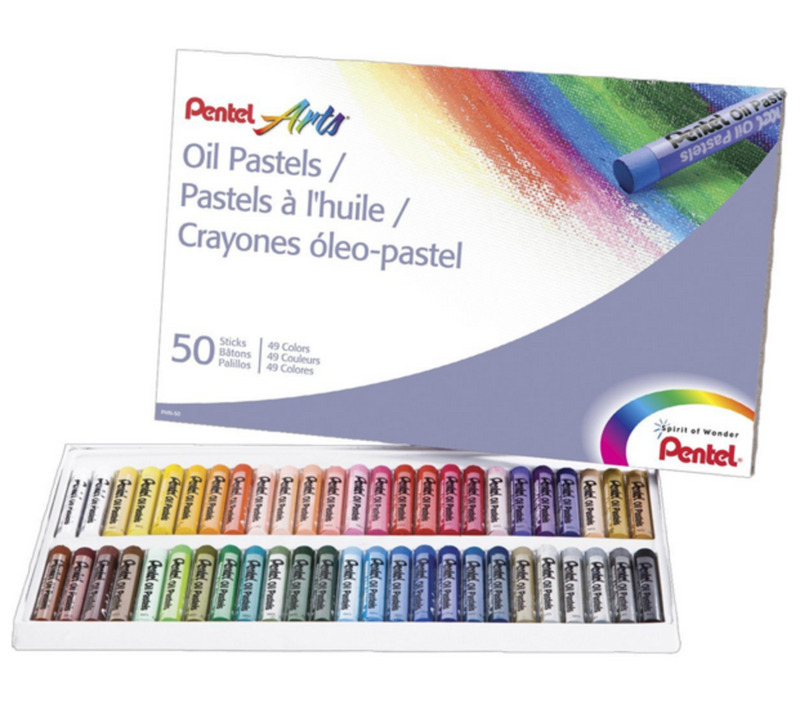 Also, it's a good idea to add some high-quality pastel-drawing paper to complete the gift. Is a pastel kit a good gift for a six year old girl? Besides being small and the occasional piece ending up in the vacuum, our little girls have enjoyed Legos for hours at a time. When our six-year-old was asked to pick a toy set out from a list, she went with the rehearsal stage set. It's more feminine in my opinion than the Star Wars set (my favorite when I was young). It's tough finding the perfect gift, but for kids that love to build physical things, this is a fantastic option and not too expensive. 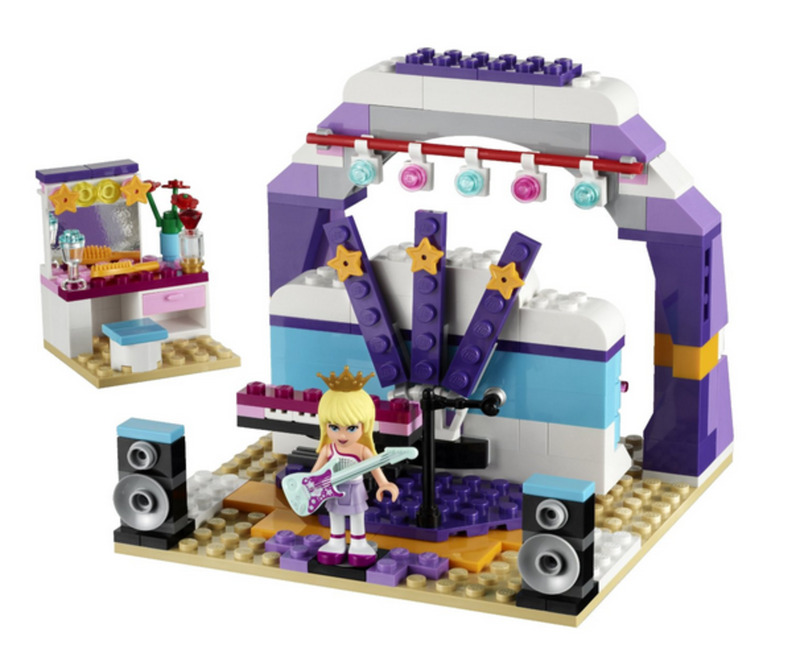 Is a girls themed Legos set a good gift idea for a six year old girl? We purchased these headphones for our daughter to use in the car. There are two reasons to get these. One, if your child has a tendency to turn the speaker way up, there is a volume control chord that limits the volume to 80% of the maximum setting. And second, if she has a smallish head. These will fit a small head. I bet they would stay on a typical two-year-old baby on the smallest setting. One of the neat things about these is they come in some fun colors, so if you have multiple kids, each can have a pretty unique set of headphones. 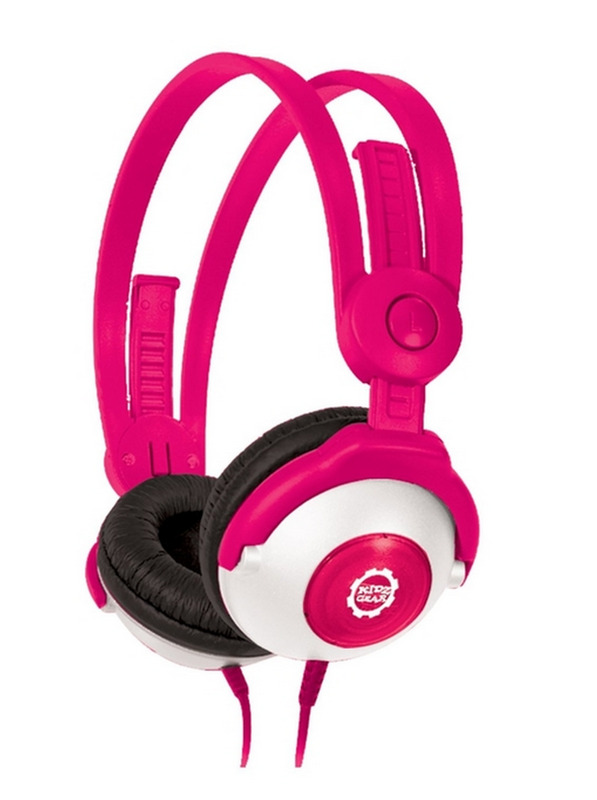 Is a kids headphone a good gift for a six year old girl? 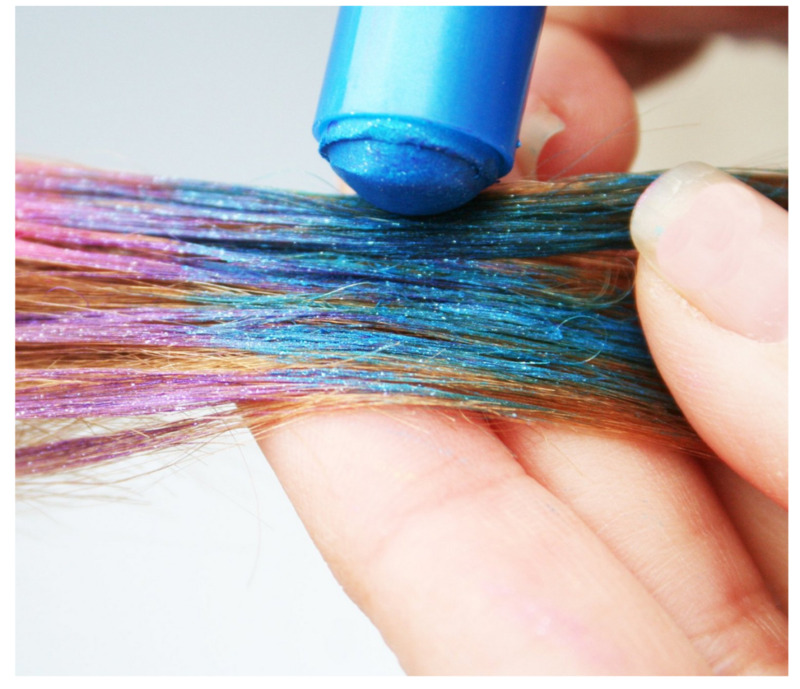 This chalk sparkles in the hair. Our girls love having some fun with coloring their hair, and this temporary hair color is pretty good. Although, my wife usually needs to help out, or one of the older kids applies the color. This makes a great Christmas gift stocking stuffer or it would be really fun to add to an Easter basket. Is hair chalk a good gift idea for a six year old girl? 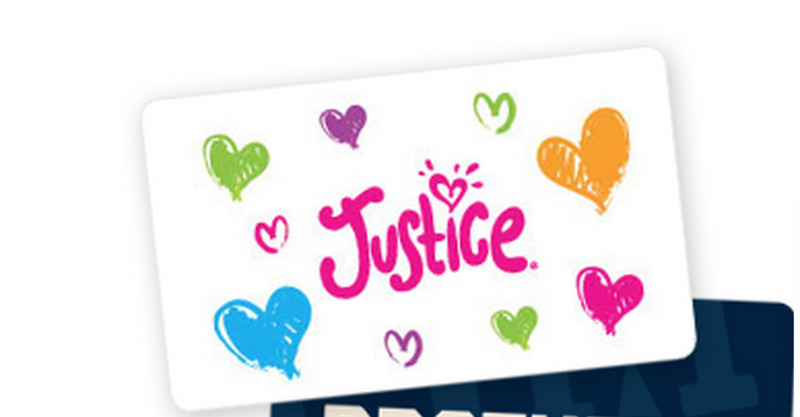 The two most girly stores we know are Justice and Claire's. Both of these have feminine kids clothing and jewelry. While these clothing shops are designing for the trendy tween, they do have clothes and jewelry for little girls. 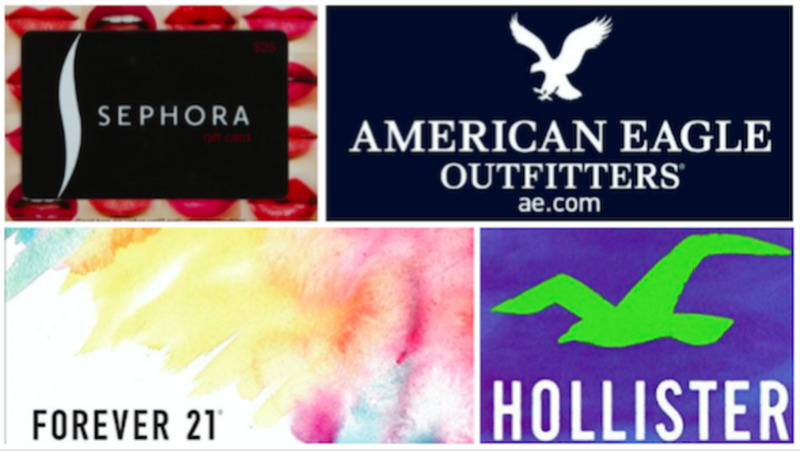 If you have a feminine fashionista, then this is the stores I'd go to for a gift card. Is a gift card to a feminine store a good gift idea for a six year old girl? Here is something a little Fancy Nancy would like. Sparkling nail polish. My wife insists that if the girls are using nail polish it has to be non-toxic. There are tons of choices and colors available, but just be sure to double check that it's non-toxic makeup. Our daughter recently went to a birthday party and they painted each girls nails and let them keep a nail polish. It was a super fun party and it made a great party favor. Is non-toxic nail polish a good gift idea for a six year old girl? Raising daughters, I've learned how important their relationship is with their best friends. When two girls become extremely close, they appreciate having a symbol of their friendship. Our daughter was given a heart shape split best friend necklace from her friend. But, then she lost it! She was so upset. She now has another one and never takes it off. 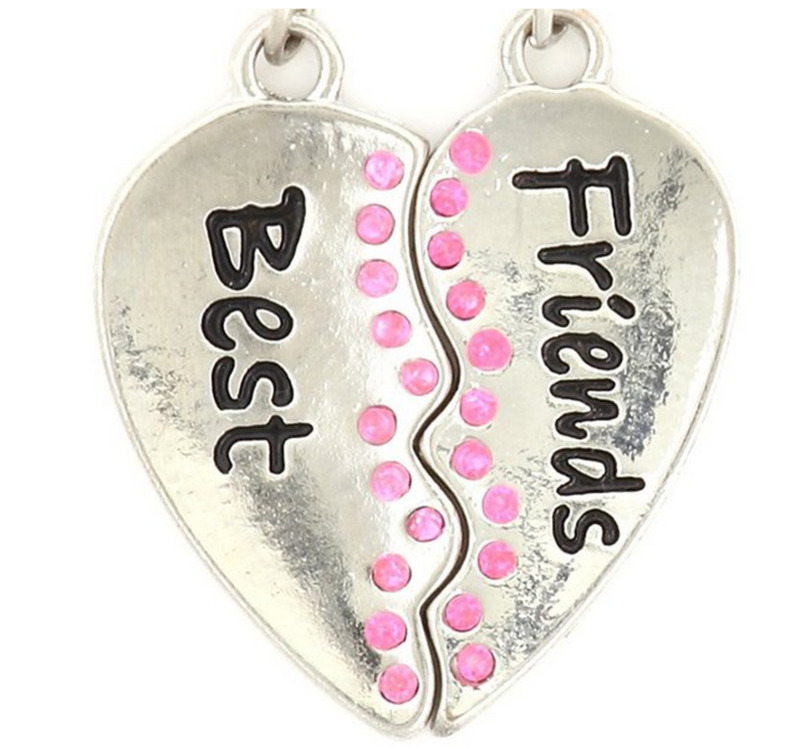 Is a best friend locket a good gift idea for a six year old girl? This year we added two traditional, but still popular gift ideas. 1. 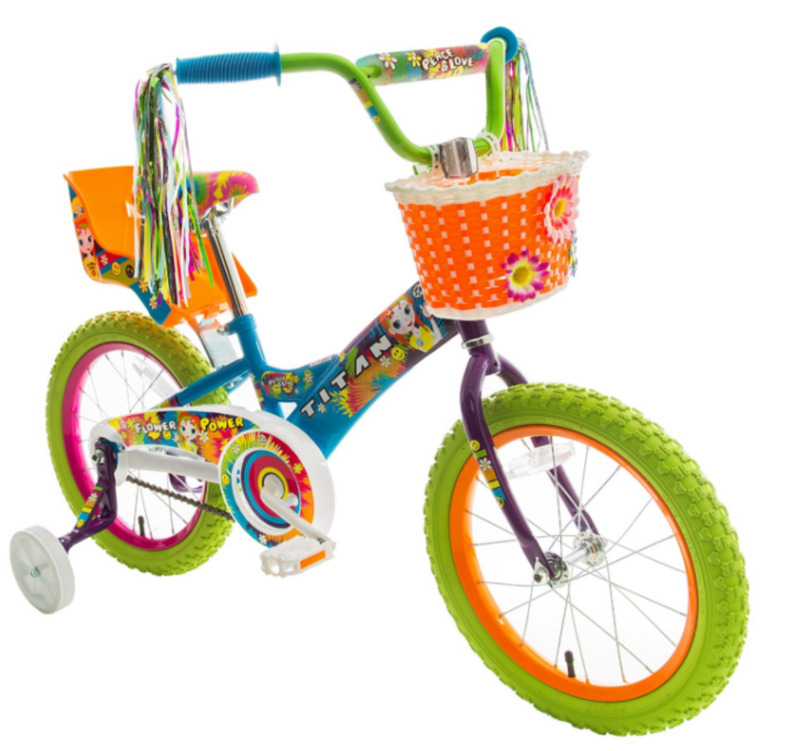 A fun and colorful girl's bicycle. 2. 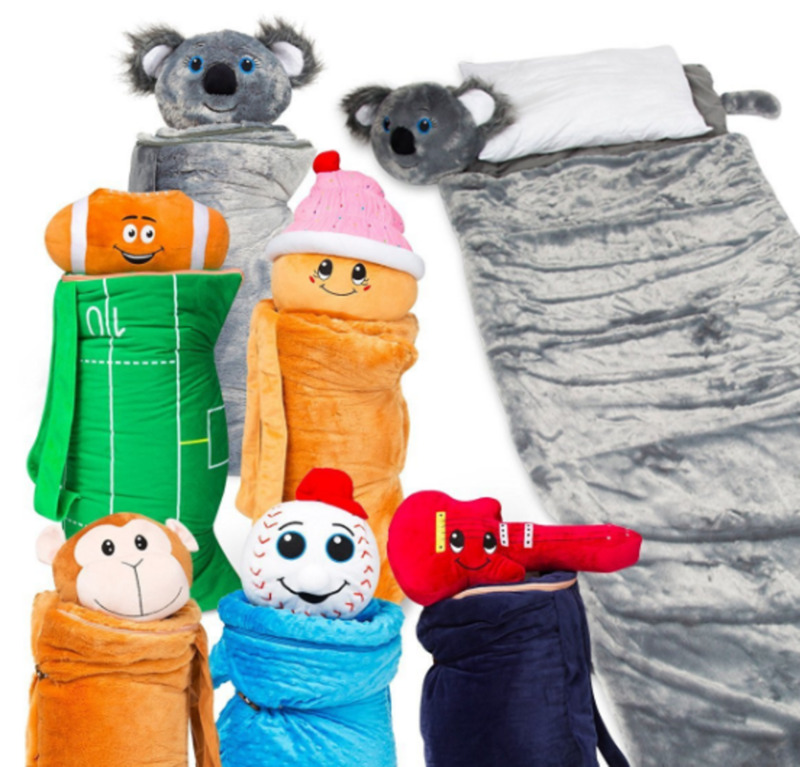 A kid's sleeping bag that is perfect for sleepovers. Is a girl's bike a good gift idea? Is a girl's sleeping bag a good gift idea? 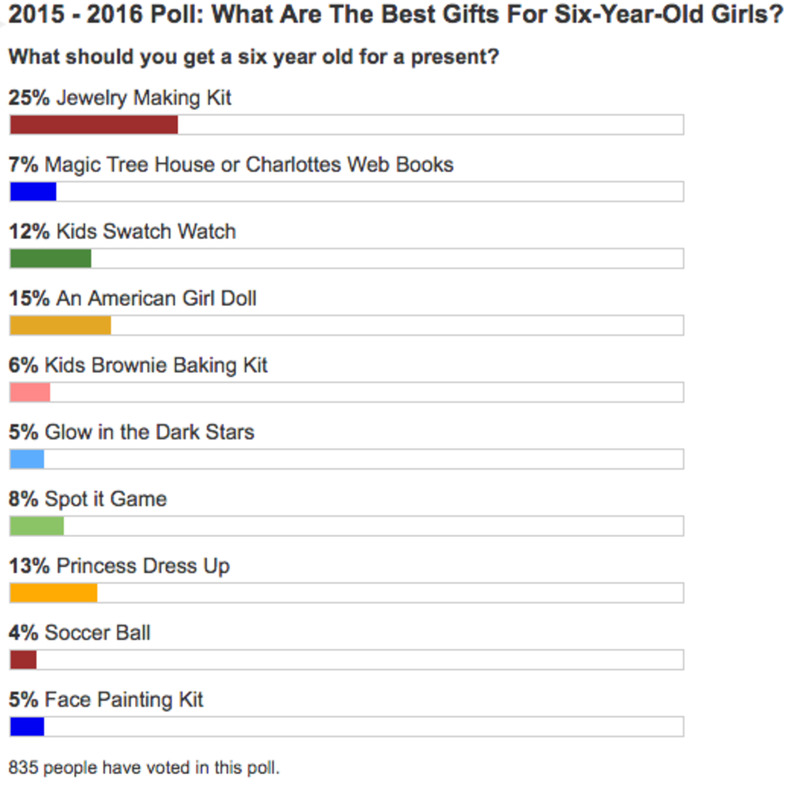 2017 - 2018 Poll: Select The Best Gift For a Six-Year-Old Girl? What should you get a six year old for a present? 47 votes so far. Click a star to add your vote! First science lab kits, apron kitchen sets, personalized anything, any of the DIY kits. Like making your own bracelets or sewing their first pillow, Tents! Karaoke machine, garden stuff, jewelry box... My six year old loves everything! Going thru the comments I just thought of some things I didn't see discussed. Happy Holidays! If you have a Barbie idea you really like, leave it in the comments and I'll add it to the list to be considered. Thanks for the suggestion. 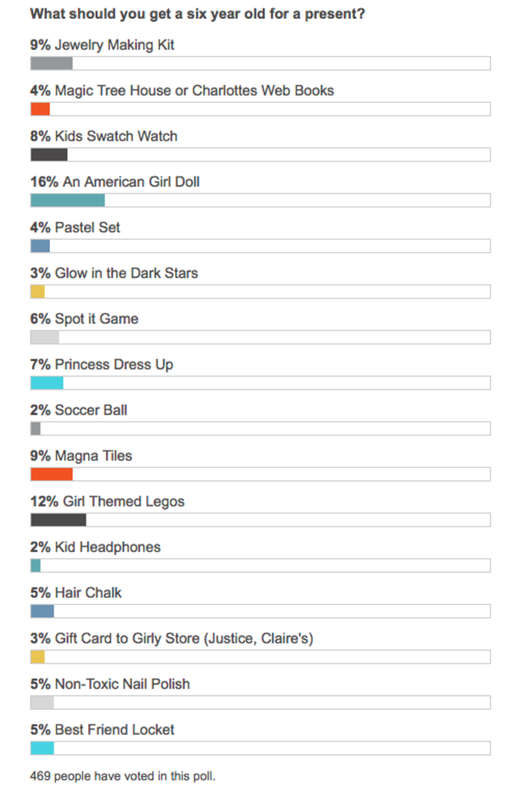 Looks like jewelry wins overall. My vote will always go to books on topics that will encourage a lifelong reading habit. And maybe a jewelry box to store all those bracelets, one that she can keep forever. It looks like people aren't digging the sport ideas very much. Any suggestions on things to add? Some good ideas for my nephew that I have bought who is seven that might be good for a 5 year old girl (non gender specific toys): books, puzzle, board games, card games, crayons (thinking about a crayon toy for next winter for a 8 year old so so much for crayons being a 3 year old toy--think most parents are too cool to buy crayons for the most part), learning coloring books, play toys, play doh, and yes (in the technology category) my nephew also has a leapster but no "real" video games. I think a leapster is plenty technology (but my nephew has an Aunt who didn't do Game boy (since it only came out then) until she was 9-10 years old so doing more than leapster at 7 is not necessary. I gave my daughter my old laptop when she was 3. It is still working, and she is 6. I think it is very important to know technology. That is the way of the world now. If you can't use a computer, forget about getting anywhere in life. The world revolves around computers and technology. You can find cheap brand new laptops for $150.00. All the child needs is educational websites, or educational programs (which are around $20.00) if there is a family computer that the child can play on, buy an educational disc. If you are too old fashion, and do not believe In technology, barbies, dress up, play makeup.... The list goes on. Walkie Talkies are an awesome idea. I'll add them to this list. Well, I fixed up an old computer for my daughter when she turned 5 and I'd have to say those of you who think it isn't a good idea are dead wrong. She's spent more time on it than any of the other gifts she has ever received. And I dare say you're never too young to start learning how to use a computer and it's not like they're going away. A laptop is a bad idea, stick with a desktop it will last longer and you'll be able to control usage much better. ok i have a 5 year old stepbrother and he uses his moms laptop all the time!! but he has an ipod and he already lost it in the house.im not saying it's a bad gift but i think you should try to get the kids outside.and even if you do give her that you should probably have an adult watch her use it. My daughter is six soon and I was really stuck for ideas. She loves basketball though so I think a hoop would be a great idea. A lap top is not appropriate for a six year old, though I do let her play kids games on mine. I think a lap top is something to think about when kids are a little older (maybe 10?) and they can appreciate them. Every kid is different. I have another daughter turning six this year and she probably wants make-up and outfits more than toys. I'm not a huge fan of toys for kids like the plasticy stuff that breaks and gets spread all over the house. I do like sporting equipment though. I agree -- a 6-year-old doesn't need his/her own computer. Get them a friggin' bike and get them outside. Buy them a basketball hoop. A butterfly net. A stepping-stone kit. A Chia pet... Anything but a computer (that they're going to inevitably wreck). Also, in my opinion, a watch is the worst gift to get anyone. Ever. Kids want TOYS, not functional, practical crap. a 6 year old does need her own computer! she is still a baby! A siz year old should still be having fun without technology, whatever happen to dolls and dress ups? My daughter is 6 in 4 weeks and I asked her what she wanted. She wants a DS. So that's what I've got her. I have a PC and a laptop and she uses mine all the time to play childrens cd-roms on so theres no reason why a laptop isn't a good idea. My daughter has bikes, scooters, inflatable giant basketball nets, a wii, books, a tv in her room with dvd player, more things than u can imagine. She looks after them all and isn't too young for any of them. I get her alot of arts & craft things as well. Educational things are the best I say. Its the age they learn most. At this age they should be able to roughly tell u what they want. Cool hub! I wouldn't say a laptop is a great present for a 6 year old, but the others are great. Thanks! I "pimped" out my 6 year olds bike for her birthday- Nantucket bike basket, Dolly ride with me seat for the back and a bell. When the snow starts to melt she is going to be on that bike daily! A watch is a GREAT idea too, but she has that. I also highly suggest sports equipment- t-ball sets, glove and ball, children's basketball hoop, mini golf set, etc. It gives them something to look forward to using if they have a winter birthday! These are some really great ideas. I think some other great things are musical instruments. A little better quality than the toddler ones. They are learning rhythm and beat. Cd's seem to be a good idea as well, especially if they have older siblings that have their own cd players. Honestly though, I usually go for the art sets. There are so many great ones out there, like make your own jewelry box and tie dye kit, as well as magnet sets. six year olds don't like color books????? I still love to color, and I color with ALL my grandkids, and they love it too! Laptop is a little too much. Don't think six year olds can take care of a laptop, especially if they have younger siblings. Books are ALWAYS good! Jewelry-making kit is a good idea if someone is around when they play with them, especially if there are younger siblings around. (I don't like to get my grandkids things that require too much adult attention...they get little time to use that stuff, and sometimes that kind of stuff gets put away and forgotten.) For me, I am going with the watch...since they already have a dog, LOL. I'm amazed to see how well a six year old can work a laptop. Get a netbook. They also have a fabulous Disney netbook. You would be better off finding a desktop computer instead of a laptop. The desktop will take more abuse from a small child than a laptop. Laptops are quite a bit more to repair if something should happen to it. Plus you really shouldn't touch an lcd screen and a small child may touch the screen and ruin it. 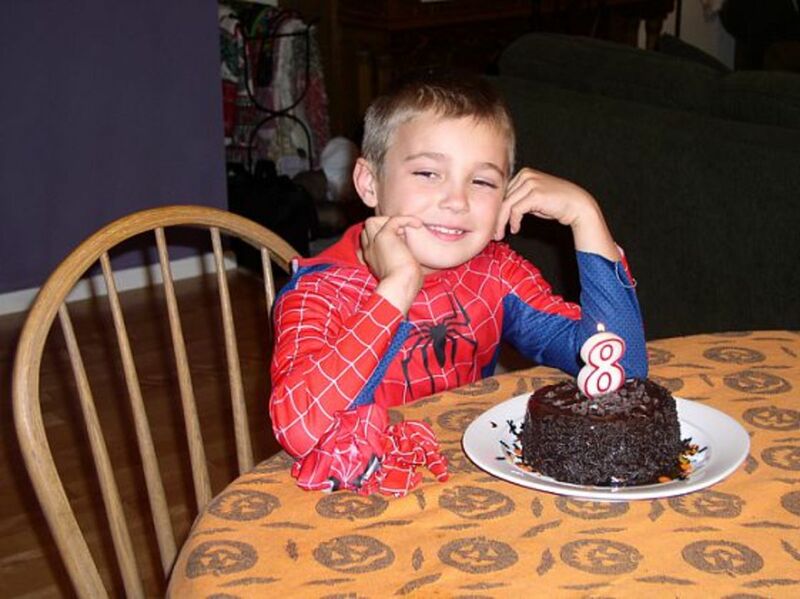 A great way to get a kid a computer for a birthday gift or any occasion is to watch craigslist. Find an inexpensive laptop for a one to two hundred and then wipe it clean and put a new operating system on it. This will help on old computer function better. This should provide all the computing power a child needs...surfing the web and playing educational games. Wow a computer, really? My daughter is six. I'm a Mac girl, so I think new computer=$1000. What's a cheaper way to get a kid into a computer? You can tell I have no children!! I thought a tennis racket would be perfect for a six year old!! Some good ideas there. I love your daughter's choice of gifts, so funny! I think that books are always a good gift; there is so much choice, and like you say, a six year old will probably get lots of joy from learning to read them themselves. My daughter is just about six and she's been telling me how cool Hannah Montana is. I worry that she's a little too snotty to be encouraged, but a watch sounds like a nice gift. Glad she liked it. On my 5-year-old niece's birthday, I got her a Hananah Montana watch and she went crazy over it! I knew she liked H.Montana, but wow! It's amazing how much impact that young idol have on kids as young as my niece. Crayons and coloring books seem like they are more appropriate for a younger child like a three to four year old. How about coloring books and crayons? Those make great gifts for 6 year old! Some really great ideas. Kids can be hard to buy for. Thank you.